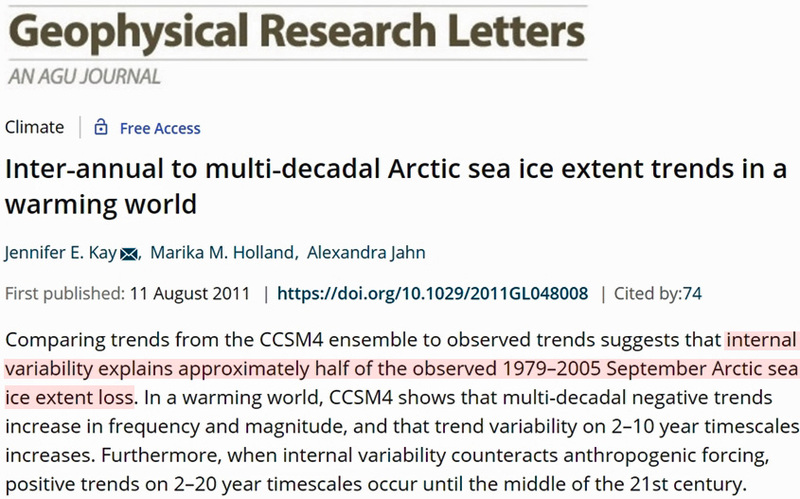 Scientists have determined that today’s Arctic sea ice concentrations are still much higher than they have been for most of the last several thousand years, undermining claims that modern era Arctic sea ice changes are remarkable, unusual, or unprecedented. 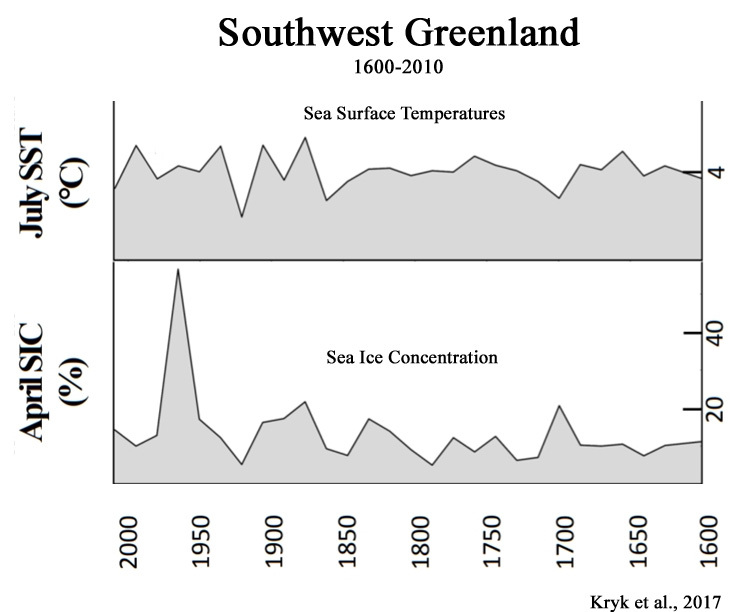 In the graphical illustration of Late Holocene West Greenland sea ice changes shown above, Kolling and colleagues (2018) indicate that both present-day and Little Ice Age era (~1300s to 1800s AD) sea ice does not melt until May.(Fig. 6a). During most of the last 2,200 years — especially during the Medieval Warm Period (MWP) and Roman Warm Period (RWP) — spring sea ice melted in March, two months earlier than today (Fig. 6b). 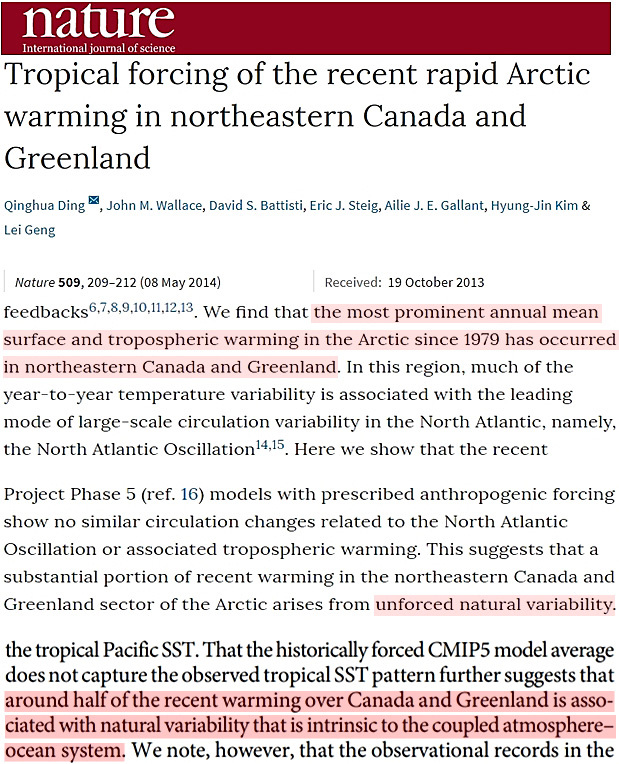 The authors attribute the lower-than-today sea ice concentrations and warmer temperatures during the MWP and RWP to a “self-amplifiying system” involving variations in solar activity and the AMO. 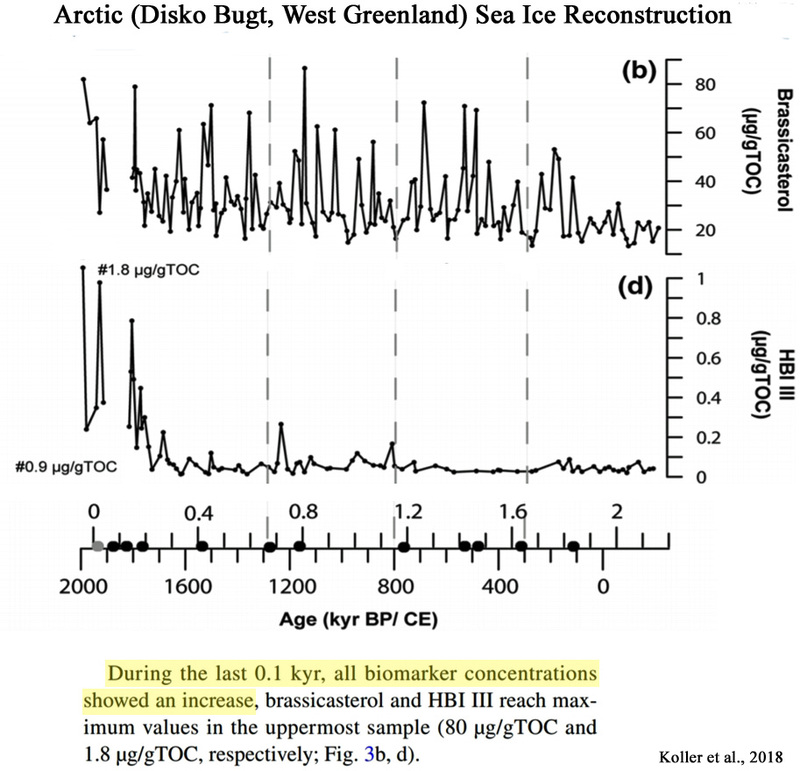 Atmospheric CO2 concentrations are not mentioned in the paper as a factor influencing sea ice changes. 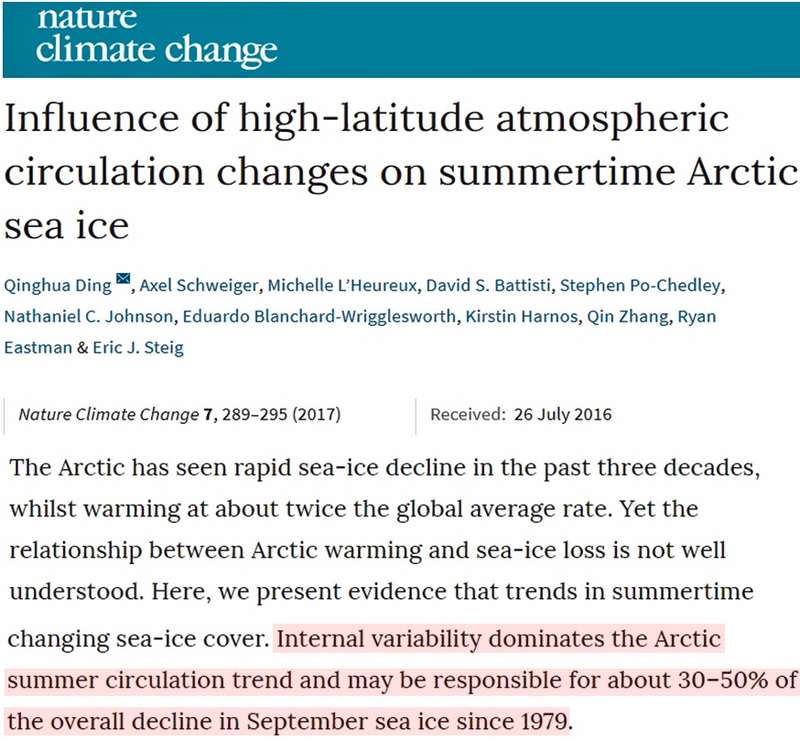 Consistent with other reconstructions for the region (Kryk et al., 2017; Durantou et al., 2012; Yamamoto et al., 2017; Perner et al., 2018), proxy evidence shows that current sea ice conditions are only modestly different than the indicated conditions during the past few centuries. 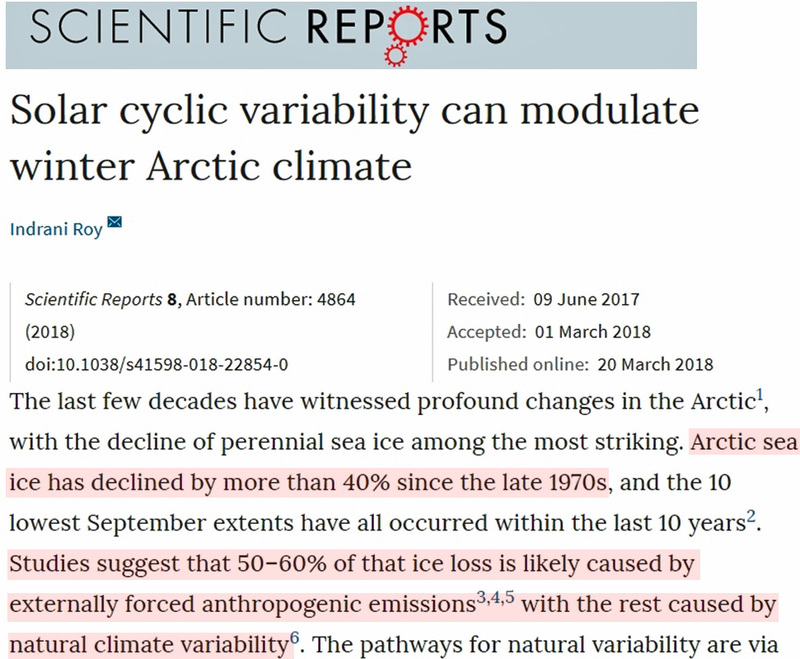 The lack of any unusual or remarkable change in sea ice conditions during the modern era relative to the past suggests there is a lack of conspicuous connection between rising anthropogenic CO2 emissions and the Arctic climate. 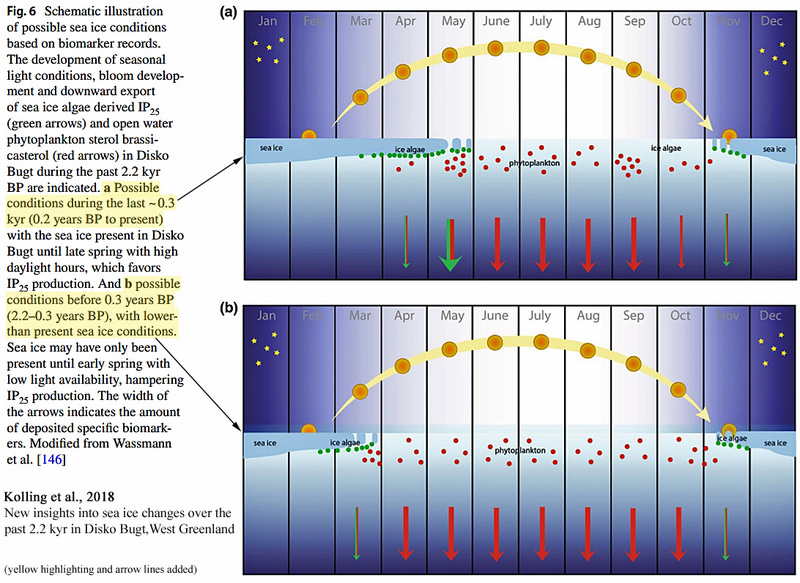 “Our biomarker record indicates that Disko Bugt [West Greenland] experienced a gradual expansion of seasonal sea ice during the last 2.2 kyr. 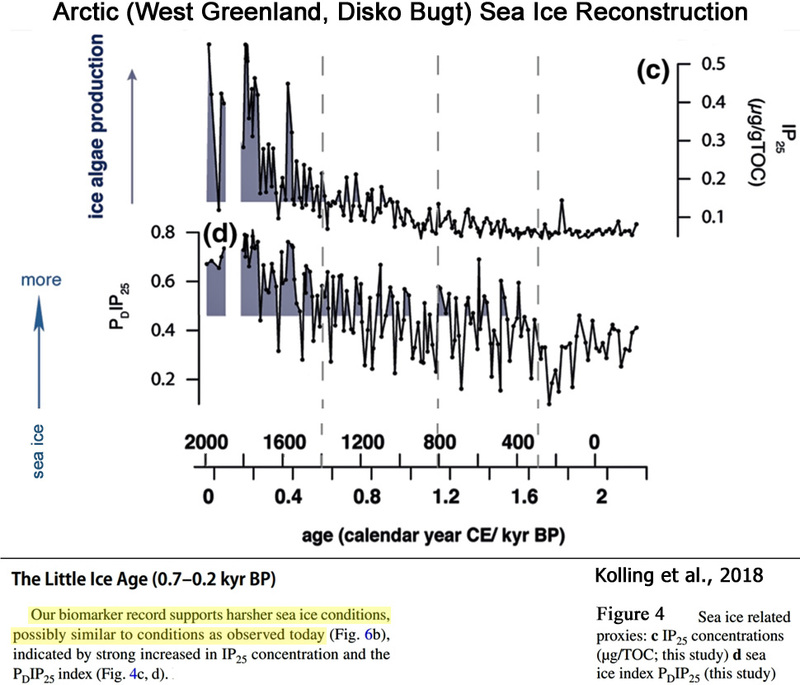 Maximum sea ice extent was reached during the Little Ice Age around 0.2 kyr BP. Superimposed on this longer term trend, we find short-term oscillations in open water primary production and terrigenous input, which may be related to the Atlantic Multidecadal Oscillation and solar activity changes as potential climatic trigger mechanisms. Greenland has name from that time! Dwellings is abandoned since then. Corps did not develop during a short summer. Again, all the data and science shows that the world is really only a small bump out of the COLDEST period in 10,000 years. We should be very thankful for that slight NATURAL warming as it has been highly beneficial, along with raised CO2 levels, to all life on this carbon based planet of ours. Those scientists from several thousand years ago must have been extremely concerned about AGW melting the ice. 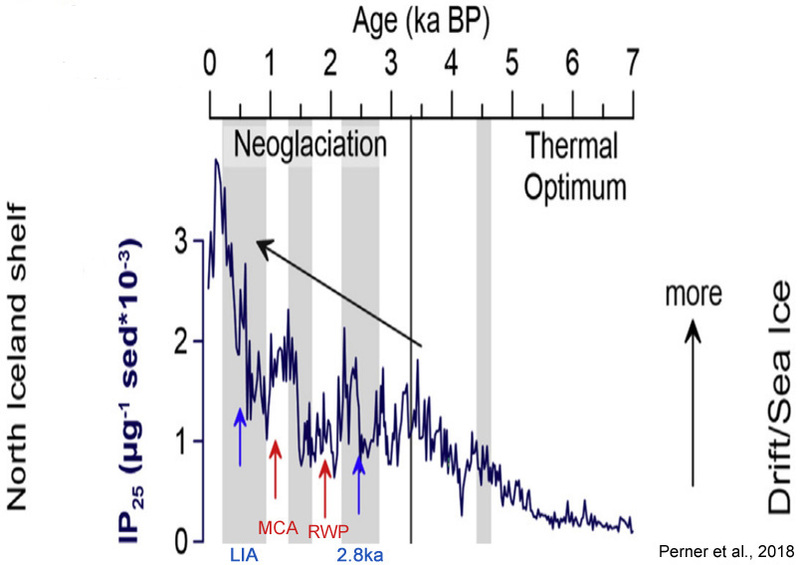 Geologists and realist in the climate area have know for ages that most of the Interglacial has been significant;ly warmer than now. Its called the NEOGLACIATION, and its the period when many of the current world glaciers and large ice caps started to form and stay formed over the whole year, reaching their peak levels during eth anomalous cold period of the Little Ice Age. The world has recovered slightly from that COLDEST of period, exposing 2000-3000 year old tree stumps under retreating glaciers, allowing the investigation of Greenland through melting permafrost exposing Viking burials and artefacts from the MWP. 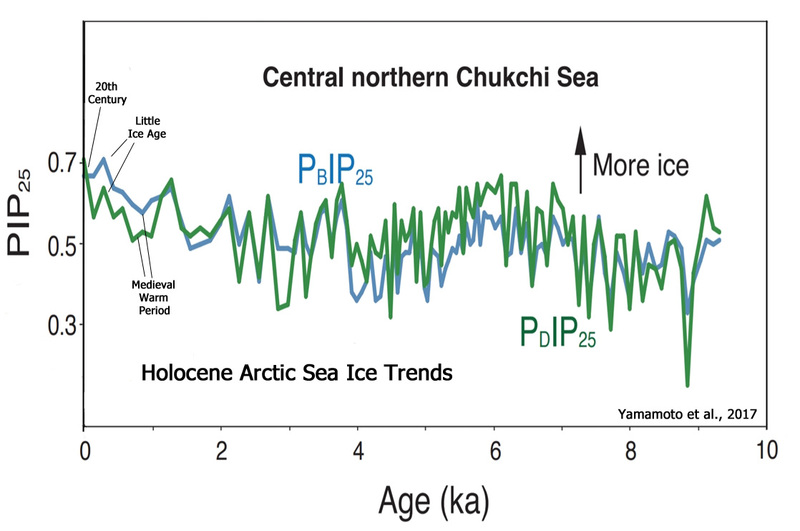 … and lot more to get back to the Holocene Optimum. 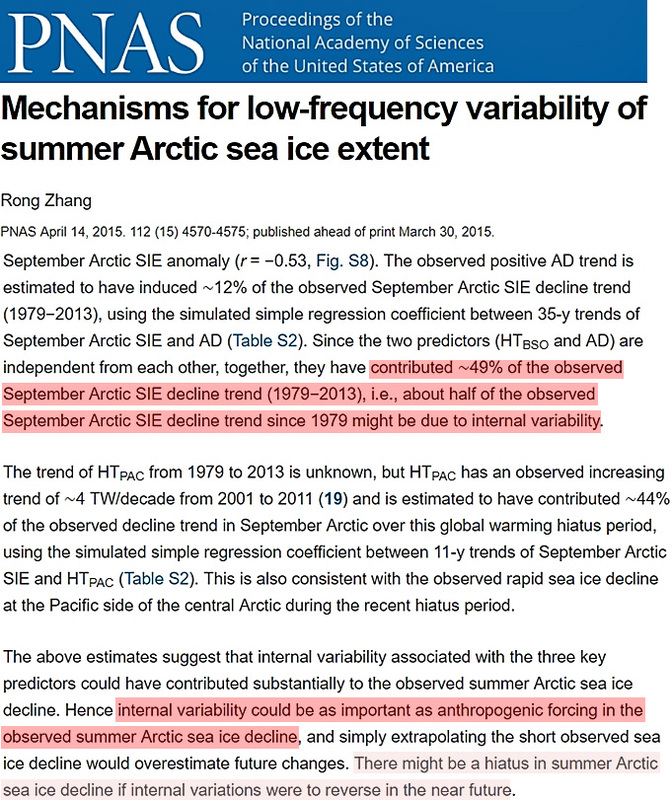 Yeah, the decreases in ice mass, volume and extent are surely totally normal and unremarkable. 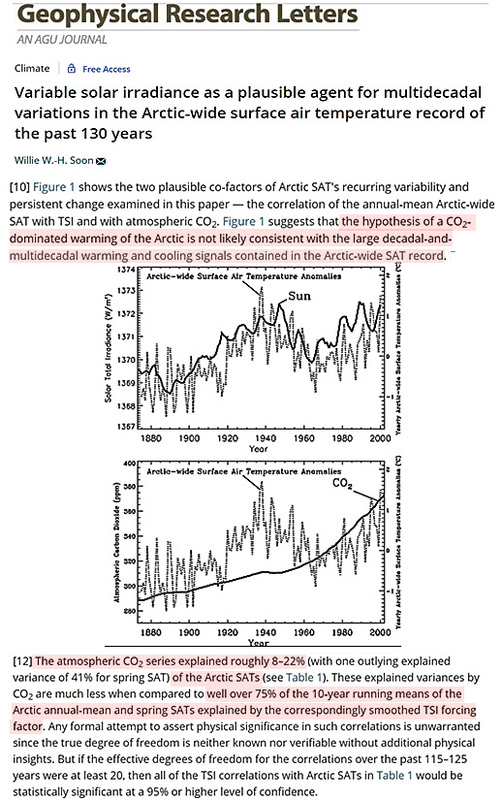 Nothing to see here, since it has happened before only it wasn’t CO2 back then. Yeah, the decreases in ice mass, volume and extent are surely totally normal and unremarkable. Correct. 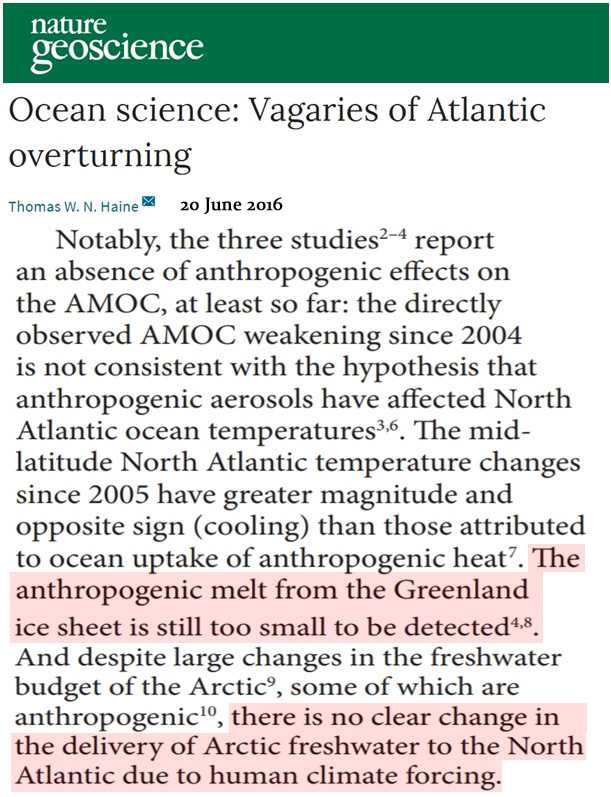 Scientists agree that “The anthropogenic melt from the Greenland ice sheet is still too small to be detected” and that “there is no clear change of Arctic freshwater to the North Atlantic due to human climate forcing“. Have you really changed your mind or was this intended to be sarcastic? If they agree on one thing then that it’s us (our emissions) that cause the current warming. I thought the “oh dear” at the end was clear enough? I’m guessing that the “half” they are attributing to nature is at a minimum, not being able (or willing) to acknowledge more? IOW, it’s a lower limit, most likely, but it could be more. And without any empirical evidence of CO2 warming. This scientifically-blind acceptance of something never measured, is quite BIZARRE ! Yes, we can all agree that current levels of sea ice are actually rather HIGH compared to the last 10,000 years. Not surprising seeing the world temperature is barely a bump above the coldest period in 10,000 years. Do you have any evidence???? We have been waiting a long, long, long, long time for this !! You have FAILED to deliver..
You are a sad, pathetic embarrassment to the AGW cult. Unable to support even their most basic conjecture. My two children have a name for people who are a bit slow. From now on you are my extra special troll. …and so MANY more. In short, if it’s on this list, SebH has probably invoked it. NOTE – With math skills like those being taught in some schools today, Leftists appear to be trying to raise an army of critical-thinking-deficit zombies, loyal only to false post-modern narratives. It’s no wonder Western Culture appears under attack. It is. John Ray has an excellent expose on it, here. …except when it has, for most of the past. Many points made there, including also one about error bars which is the same point made by Lindzen, i.e., that anomalies are insignificant when you consider the relatively massive errors in the data used to generate them. So, basically, there isn’t any conclusive data that the world has warmed appreciably, let alone that CO2 is “causing” it to do so. Those two were probably the most trustworthy REAL scientists in the climate science area. First, they were actual scientists. Second, they never allowed brain-washed mantra to rule their thinking. Fourth, the very fact that seb thinks they are not, PROVES that they are. Seb is renowned LIAR and COWARD, and basically everything he says should be taken as being a load of brain-hosed, anti-science garbage, diametrically opposed to reality. Pierre, please do something about the lying ad hom spewing sack of troll spit self-identifying itself as SebastianH.